This fall, Shen Yun Symphony Orchestra will be performing not only at Carnegie Hall and other North American venues, but also at some of the most venerated concert halls in Japan and Taiwan. The orchestra will be presenting an exciting new program of original Shen Yun compositions, which capture the melodies of ancient China, alongside classical masterpieces. 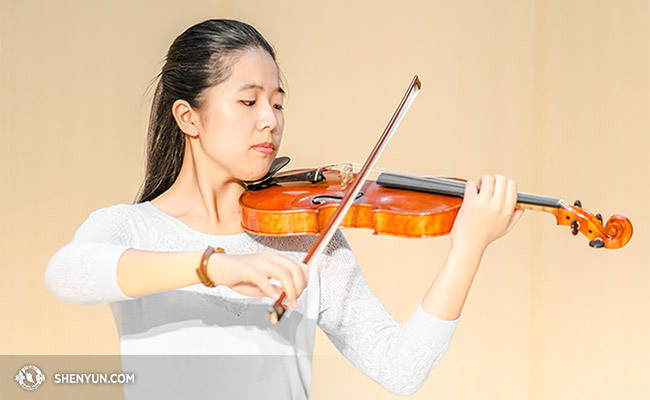 This year’s concert will see the return to the stage of violin soloist Fiona Zheng, who made her debut at Carnegie Hall last year. 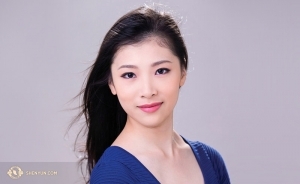 She will be performing Camille Saint-Saëns' famed Introduction and Rondo capriccioso. Between rehearsals, we were able to sit down with the quiet and unassuming virtuoso for a short conversation. Q: Let’s start from the top: When did you begin studying violin, and why? FZ: I actually started on the piano when I was 3, but wasn’t very good at it. My dad is a violinist and he wanted me to learn as well, so I switched to violin when I was 5. That went well, and so I stuck with it. From a young age, I remember being told my technique was very advanced. I think I also benefited a lot from practicing Falun Dafa from a young age. This is an ancient meditation practice based on the principles of “truth, compassion, and tolerance.” It helped me clear my mind and get rid of distracting thoughts; it helped me concentrate and stay in a peaceful state of mind when playing. 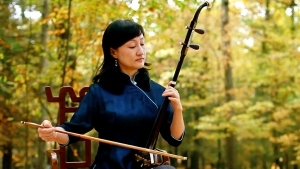 I started practicing Falun Dafa in third grade and it affected different aspects of my life—like my grades became very good, and my violin playing really improved. People usually say “practice makes perfect.” As an artist, I think your connection with your craft does depend on how much effort you dedicate to it. But, at the same time, there’s also the expression “God-given talent,” which resonates with my belief that art is a gift bestowed upon us from the gods. I believe that when you improve your moral character and constantly elevate your spiritual realm, your craft will improve as well, just as if the divine is guiding you. Q: What is it about performing that you enjoy? FZ: I’ve always felt a special connection to music. When I was young, if I felt under the weather, listening to music always made me feel better. The best music, I think, isn’t just about technique and precision; the best music can communicate a performer’s feelings and touch a listener’s heart. 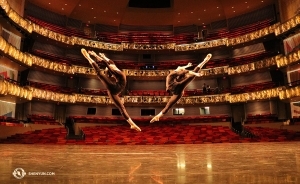 So, as a performer, your own heart has to be wide open. 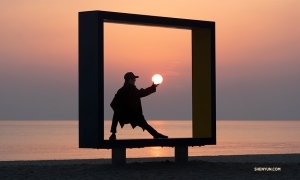 You need to be willing to expose your innermost thoughts to an audience of thousands. Because of this, sincerity is extremely crucial. Q: Last year you received rave reviews for your performance of Sarasate’s Zigeunerweisen. How did you interpret this classic piece? FZ: I generally split the piece into three parts. Most people interpret the first section as intense, but I find it has more of a helplessness and sadness about it. The second portion has freer rhythms and transitions to a different mood. Lastly, I envision the allegro section as a lighthearted, joyful dance. Actually, when I was younger, Zigeunerweisen was my favorite piece because I enjoyed the liveliness of the third part. Nowadays I prefer the second part because I feel it can reflect my inner self. Usually before playing this piece, I’ll imagine playing it for someone very close, like a best friend. Actually, I do have a very personal interpretation of this piece—it reminds me of my experiences in China. When I was 3, my grandmother began practicing Falun Dafa. She was the first in our family. She used to have many ailments, such as high blood pressure, and her hips were covered in boils. But after starting this meditation exercise, these miraculously disappeared. Naturally, we all saw the changes in her and soon my entire family starting practicing Falun Gong. But in 1999, the Chinese Communist Party launched a nationwide crackdown and began persecuting Falun Dafa practitioners. In 2006, policemen barged into our home, took all of our Falun Dafa books, and arrested my mother and grandmother. Both my mother and grandmother passed away from torture and persecution—their deaths only 15 days apart. Afterwards, my father and I were constantly on the move—like the gypsies that inspired Sarasate’s Zigeunerweisen—always roaming around to avoid persecution. I was constantly terrified that I would be arrested, and I never understood why the Chinese Communist regime was treating us like this. Is there anything wrong with believing in “truth, compassion, and tolerance”? Why are they persecuting innocent people? So, after experiencing all of this, I feel a stronger connection to this piece. Q: And what are you performing as part of this season’s concert tour? FZ: This year I’m performing Camille Saint-Saëns’ Introduction and Rondo Capriccioso. There’s an interesting connection between it and the piece I played last year. Saint-Saëns dedicated this piece to Sarasate, who not only composed Zigeunerweisen, but was a well-known violin virtuoso in his own right. Sarasate was a Spaniard, and this piece includes Spanish folk melodies. It’s full of panache, and has been performed by so many famous violinists over the years. For the audience, it’s a familiar masterpiece they usually really enjoy. 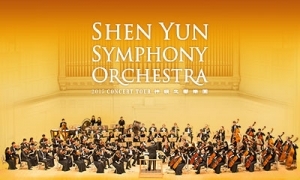 Q: Shen Yun Symphony Orchestra plays both purely classical pieces and Shen Yun’s Chinese-style compositions. What differences do you see between them? FZ: Well, it’s a lot like the differences between ballet and classical Chinese dance. Classical Chinese dance, while delicate, conveys human emotions with tremendous vividness, and traditional Chinese music is much the same. In our Chinese pieces I see very subtle and nuanced emotion, and I find Western music more lavish and grand. I greatly enjoy both styles. 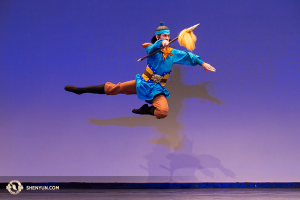 Q: What can you tell us about Shen Yun’s Chinese melodies? 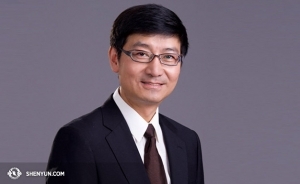 FZ: Traditional Chinese culture has been slowly disappearing, but I believe that music inspired by authentic Chinese traditions, like Shen Yun’s, can still resonate with any audience. Although our compositions are contemporary, they give people a sense of closeness to ancient China. For me, the music evokes early Buddhist and Taoist thought, and the ancients’ faith in the divine—it’s a very sacred feeling. Q: What was it like to have an opportunity to perform a solo at Carnegie Hall? FZ: Of course, performing at Carnegie Hall can give a musician a lot of pressure. But to be honest, I don’t think it matters where you’re performing or even who you’re performing for. Whether you’re at Carnegie Hall, or just among family and friends, the most important thing is creating a connection with the audience. That process of sharing your heart’s compassion with others is what I find most fulfilling. FZ: Oh yeah, I actually get very nervous! It’s like this—I’m usually the most nervous when I come out from backstage and walk to the front of the orchestra, up until I play the first note. Once I play that note, I start concentrating on the music, stop worrying, and just focus on sharing what my heart wants to say. When performing, I always try to be tranquil. In the past, if I were about to go onstage, I would practice my techniques like crazy, trying to keep myself in the most optimal state. But now, I try to calm myself down, and I always meditate before I perform. This helps me a lot more than last minute practicing—it makes my music more powerful, and I can feel the energy flowing from every note. Q: What advice would you give young, aspiring musicians? FZ: A teacher once told me: “Don’t think about anything else—just always try to do your best and it’ll be fine.” The point was to just focus on making music with all your heart and not worry about anything else. Hold on to that beginner’s earnestness, and always work hard to improve, no matter how long you’ve been playing. Q: What can we expect from this year’s program? FZ: For the Western pieces, we’ve selected some very approachable works that are easily accessible even if you’re not a music buff. That goes for our Chinese-inspired pieces as well; much like Beijing’s Forbidden City, these pieces have a grand and majestic air that jumps out at you right away. I think you’ll find it very enjoyable and unlike any concert you’ve ever experienced. FZ: Yeah, there’s something else, intangible, that I think audience members can feel during the concert. 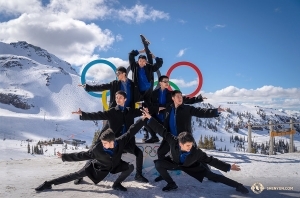 Most of Shen Yun’s musicians also practice Falun Dafa. And so, as a group, we aspire to better ourselves by following the practice’s principles of “truth, compassion, and tolerance.” Through performing music, we also wish to spread a message of hope and compassion, and I think our audience members can feel this.